The Molecular and Optical Physics Laboratory (MOPL) provides an excellent setting for laser-based research in optical or molecular physics, with various interesting projects either underway or contemplated in the near future. Previous Honours and PhD graduates from MOPL are now employed in the photonics industry and in R&D institutions (universities, CSIRO, DSTO, …) in Australia, Europe and the USA. MOPL activities range from fundamental high-resolution studies of molecular spectroscopy and energy transfer, through development of tunable laser and nonlinear-optical devices, to laser-based diagnostic sensing applications in the environment (e.g., atmospheric processes), industry (e.g., control of combustion, smelting, etc. ), agriculture (e.g., sensing of methane emissions from livestock and ammonia from fertilisers and farmland soil), biomedicine (e.g., clinical breath analysis, spectroscopic imaging) and forensics (e.g., trace detection of explosives, post-blast residues and pathogens). In another recent application, lasers, optical fibres and other photonic devices are being used in remote high-fidelity frequency control of radio-telescope arrays for very large baseline interferometry. Much of MOPL's recent and ongoing work is slanted towards possible commercial or industrial uptake of new laser-based instruments and sensing techniques that have been developed. Several items of our laser-based intellectual property have been through the preliminary stages of commercialisation. In cavity ringdown (CRD) spectroscopy, tunable coherent light (e.g., from a laser) interacts efficiently with gas-phase molecules in a highly reflective resonant optical cavity. Tuned coherent radiation bounces back and forth in the cavity, travelling many kilometres. Weak absorption spectra (e.g., at low molecular concentration) are then measurable with high sensitivity and photometric precision. The rate at which light 'leaks' out of the cavity is readily converted to an absorption spectrum. 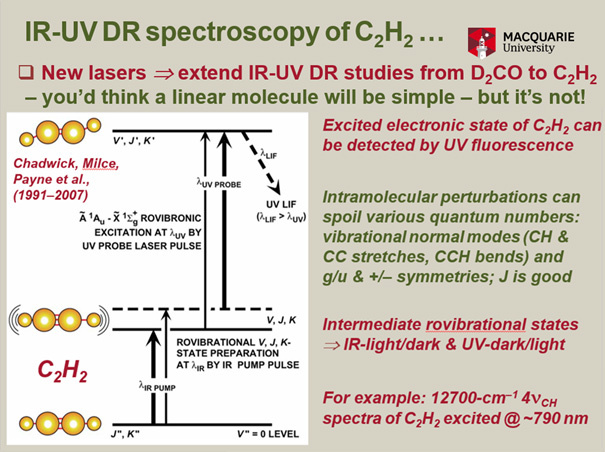 The conventional form of CRD spectroscopy employs pulsed coherent light, but new ways to use continuous-wave (cw) sources have been developed. 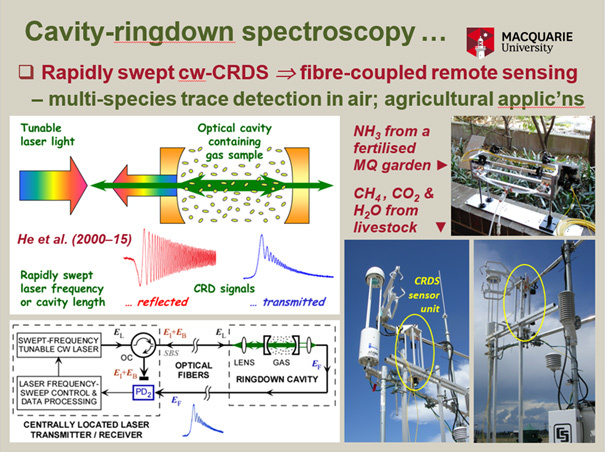 Research on CRD spectroscopy within MOPL has led to compact CRD spectrometer designs based on a rapidly-swept optical cavity, miniature tunable diode lasers, fibre optics, and other optical telecommunications components. Key features of the MOPL innovations, such as optical-heterodyne detection, allow the optical transmitter and receiver to be located in a single module that is linked to one or more CRD cavities by optical fibres for environmental gas sensing over long distances (up to tens of km). Our recent work in this area has focused on environmental and agricultural applications within the CSIRO Livestock Methane Research Cluster, aiming to remotely monitor atmospheric emissions of methane (a greenhouse gas) from cattle and ammonia (a key source of nitrogen) from fertilised soil and animal wastes. Illustrations concerning this work are shown below. Y. He, C. Jin, R. Kan, J. Liu, W. Liu, J. Hill, I. M. Jamie, and B. J. Orr, "Remote open-path cavity-ringdown spectroscopic sensing of trace gases in air, based on distributed passive sensors linked by km-long optical fibers," Optics Express 22, 13170 - 13189 (2014). Optical parametric oscillators can efficiently convert a coherent pump-laser wave (with frequency ωP) to two new coherent optical waves: signal (ωS) and idler (ωI), such that ωP = ωS + ωI. The efficiency of the nonlinear-optical process that generates these waves depends on phase-matching conditions that require minimal mismatch Δk between optical wave vectors, i.e., Δk = kP – kS – kI ≈ 0. Various specially engineered solid-state materials (identified by acronyms such as BBO, PPKTP, PPLN, OP GaAs, etc.) with nonlinear-optical coefficient χ(2) can then be placed inside a laser-like optical cavity to optimise the OPO’s optical conversion efficiency and output power. Signal and idler output from a simple free-running OPO (with no wavelength control elements) tends to be broadband (with a relatively wide spread of output frequencies ωS and ωI). To generate narrower optical bandwidths and to control the output frequencies ωS and ωI precisely, optical tuning elements (e.g., étalons and/or gratings) are often inserted into the OPO cavity. However, this introduces losses in the cavity which tend to invite damage to the nonlinear-optical crystal as the threshold for oscillation of the OPO approaches that for optical damage. Much of the developmental work on OPOs at MOPL has focused on injection seeding (by an external narrowband tunable laser) of an OPO cavity. Such an approach is advantageous because it is modular (with the OPO oscillation/amplification stage separated from the wavelength-control stage). We have shown that wavelength control by injection seeding is readily applicable to OPOs with pulse widths of ~10 ns. 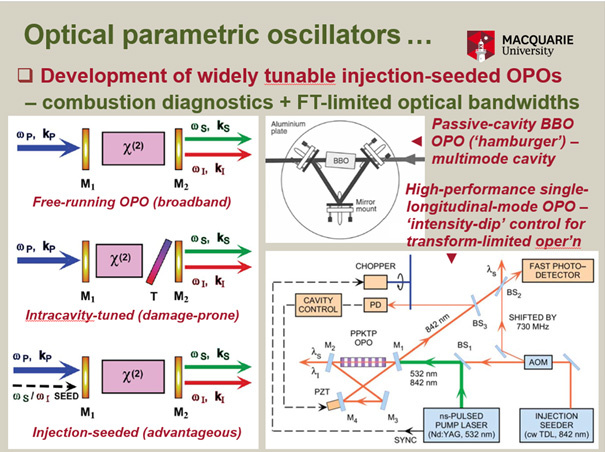 We have demonstrated a simple OPO design, in which a passive multi-mode optical cavity is simultaneously injection-seeded at more than one seed frequency ωS or ωI. This is useful for multi-wavelength spectroscopic sensing, as in the case of dual-line spectral OPO CARS (coherent anti-Stokes Raman scattering) thermometry of nitrogen in furnace air illustrated below – an example of so-called "spectroscopic tailoring" of an OPO. Higher spectroscopic resolution and finer tunability of output frequencies ωS and ωI generally requires active cavity control (e.g., as in the following "intensity-dip" scheme) for single-longitudinal-mode, Fourier-transform-limited, continuously tunable operation of pulsed OPOs. 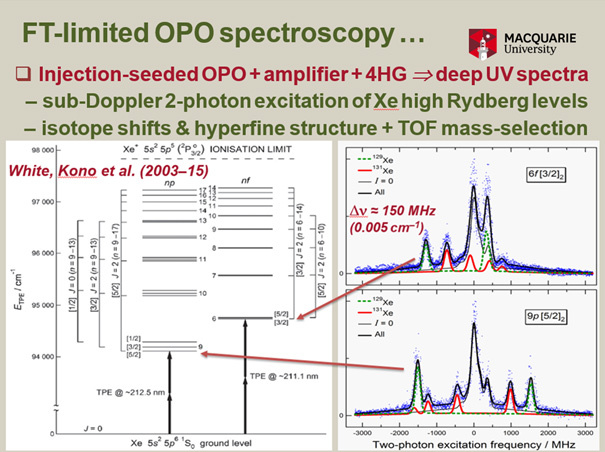 For example, we have used a tunable OPO-based spectroscopic source of coherent, narrowband, deep-UV light in ionisation-detected, two-photon excitation studies of atomic xenon (Xe) in high-energy Rydberg levels; we have resolved and characterised isotope energy shifts and hyperfine structure in this region for the first time (see below). Ongoing work in this area has implemented a time-of-flight mass-selective detection system to discriminate individual Xe isotopes and thereby further resolve spectroscopic details. B. J. Orr and Y. He, "Tunable nonlinear-optical devices for laser-spectroscopic sensing," in Nonlinear Frequency Generation and Conversion: Materials, Devices, and Applications IX, ed. P. E. Powers, Proceedings of SPIE 7582, 75820J/1 – 75820J/14 (2010). Y. He, P. Wang, R. T. White, and B. J. Orr, "Spectroscopic applications of optical parametric oscillators," Optics and Photonics News, 13 (5), pp. 56 – 60 & 76 (May, 2002). 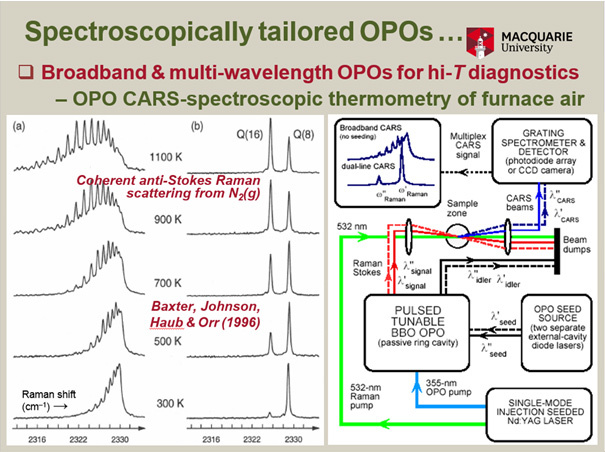 G. W. Baxter, M. J. Johnson, J. G. Haub, and B. J. Orr, "OPO CARS: coherent anti-Stokes Raman spectroscopy using tunable optical parametric oscillators injection-seeded by external-cavity diode lasers," Chemical Physics Letters 251, 211 – 218 (1996). For short pump-probe delay periods Δt, the pump-then-probe technique enables unambiguous identification of features in highly congested molecular spectra. Such features can be displayed by continuously scanning the optical frequency of either the pump excitation source or the spectroscopic probe. As the pump-probe delay period Δt increases, the pump-then-probe technique discerns various satellite peaks that grow into the double-resonance spectrum, owing to various forms of collision-induced state-to-state energy transfer. By continuously scanning the pump-probe delay period Δt, with pump and probe frequencies fixed, it is possible to generate sets of characteristic kinetic curves that can be modelled in terms of appropriate collision-induced energy-transfer mechanisms. In some cases (for instance, in quantised energy manifolds molecular states that are affected by strong intra-molecular perturbations), previously unexpected forms collision-induced energy-transfer mechanism are found to arise, some of them with significant photochemical implications. Such gas-phase studies of collision-induced state-to-state energy transfer channels can complement full-scale molecular-beam experiments and serve as precursors for more advanced molecular investigations. Definitive identification of features in the highly congested 410 and 610 hot bands at a near-UV wavelength of ~365 nm in the congested rovibronic (rotational-vibrational-electronic) spectrum of D2CO. 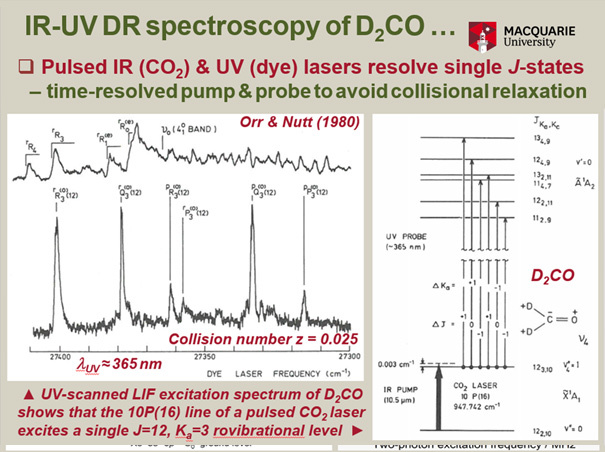 Likewise, coincidences between the CO2-laser spectrum and particular features in the ν4 (out-of-plane CD2 wag) and ν6 (in-plane CD2 wag) rovibrational spectra at a mid-IR wavelength of ~10.6 μm. 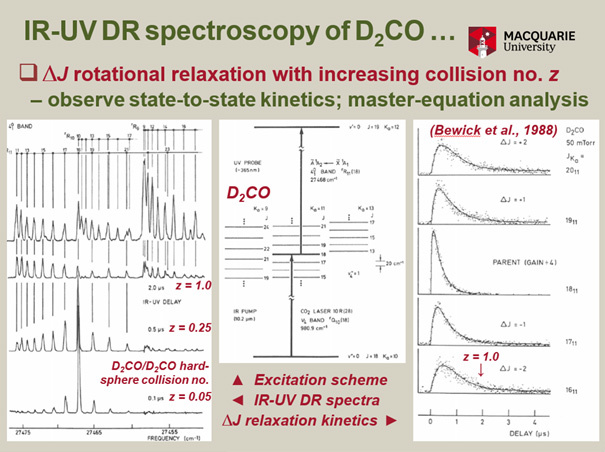 Characterisation of collision-induced rotational energy transfer between states within a particular D2CO vibrational level (ν4 or ν6), as well as analysis of associated Δt-scanned kinetic curves. 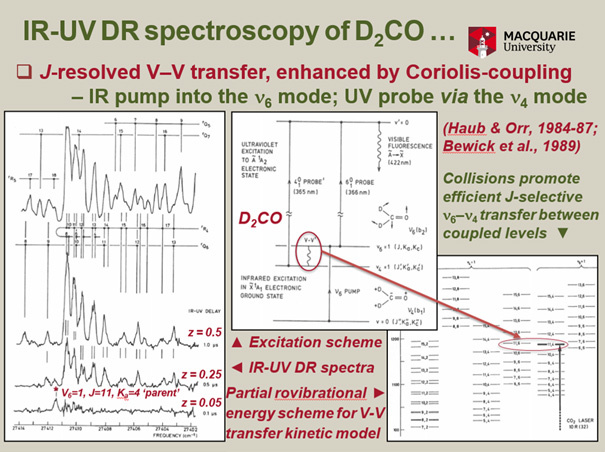 Characterisation of unusually efficient collision-induced rovibrational V–V energy transfer between specific rotational states of the ν4 and ν6 vibrational levels of D2CO, owing to strong Coriolis-coupling effects, which have been mechanistically analysed and kinetically modelled. 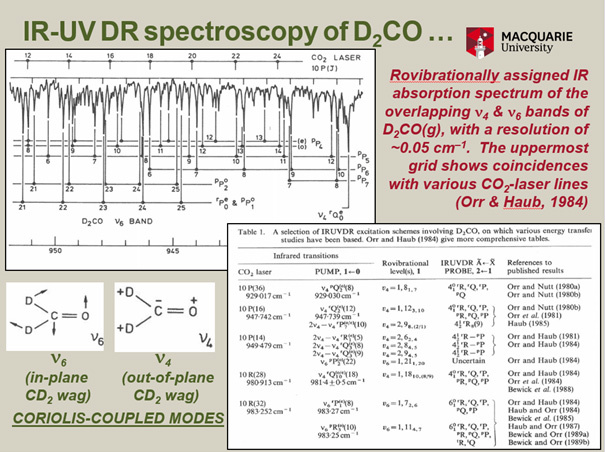 Confirmation and/or identification of many details of the rovibrational and rovibronic spectra of C2H2. 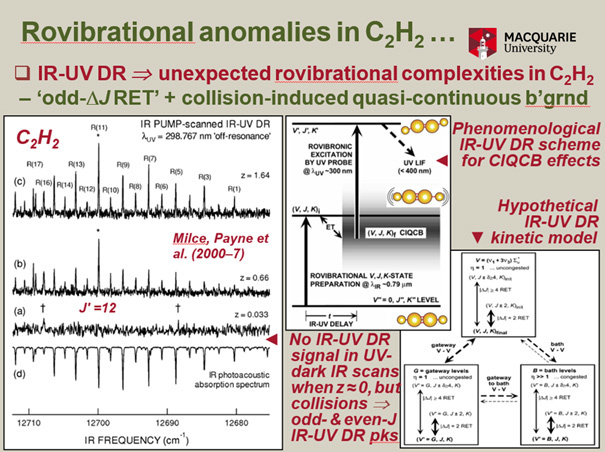 IR-UV DR spectra and their collision-induced rovibrational energy-transfer kinetics have revealed severe complexities in high-energy overtone/combination-band rovibrational levels of C2H2, where various conventional quantum numbers and symmetries are spoiled by strong intra-molecular perturbations. This gives rise to apparently unusual phenomena such as odd-ΔJ rotational energy transfer (where only even-ΔJ transfer is usually expected) and puzzling collision-induced quasi-continuous background effects which are likely to be significant in the context of state-specific photochemistry. 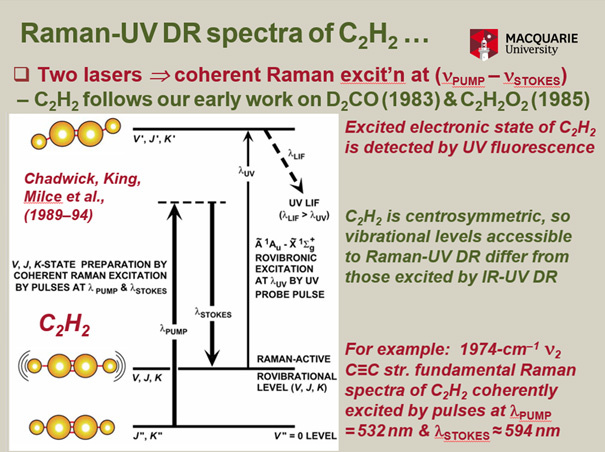 Owing to the mutual exclusion principle, Raman-UV DR spectra access a C2H2 rovibrational manifold of different symmetry to that accessed by IR-UV DR. A simple but technically significant example illustrated below entails coherent-Raman excitation of cold C2H2 molecules in a skimmed, collimated molecular beam – this offers prospects for beam-gas or crossed-beam experiments involving Raman-selected molecules. M. A. Payne, A. P. Milce, M. J. Frost, and B. J. Orr, "Rovibrational energy transfer in the 4νCH manifold of acetylene viewed by IR-UV double resonance spectroscopy. 5. Detailed kinetic model," Journal of Physical Chemistry A 111, 12839 – 12853 (2007). B. J. Orr, "Spectroscopy and energetics of the acetylene molecule: dynamical complexity alongside structural simplicity," International Reviews in Physical Chemistry 25, 655 – 718 (2006). 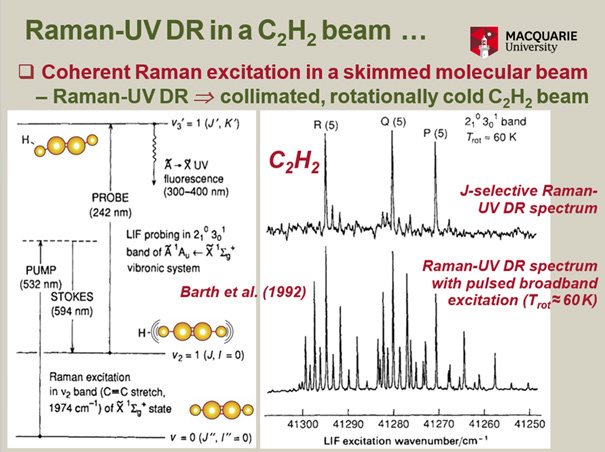 H.-D. Barth, A. P. Milce, B. L. Chadwick, and B. J. Orr, "Raman-ultraviolet double-resonance spectroscopy of acetylene in a skimmed molecular beam," J. Chem. Soc., Faraday Transactions 88, 2563 – 2564 (1992). B. J. Orr, "Time-resolved infrared-ultraviolet double-resonance spectroscopy of formaldehyde-d2," International Reviews in Physical Chemistry 9, 67 – 1138 (1990). 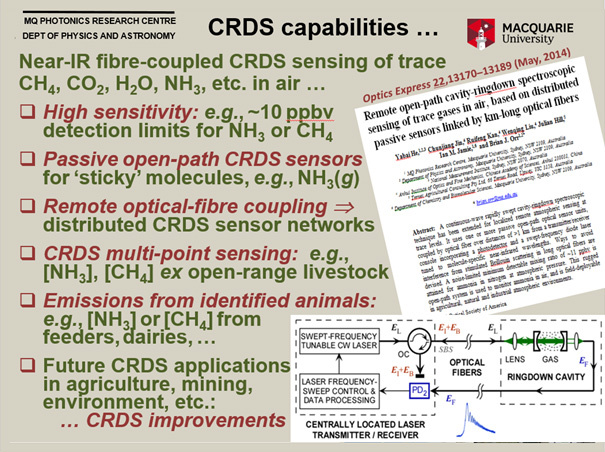 Optical fibres have been widely used within the MOPL research group for transmission of coherent light over long distances (e.g., in our CRDS work – see above). In a major collaborative ARC-funded Linkage Project, we have been developing new methods for high-fidelity long-distance transfer of a discrete radio-frequency (RF) or optical frequency over optical fibres, with particular reference to the needs of radioastronomy and metrology. 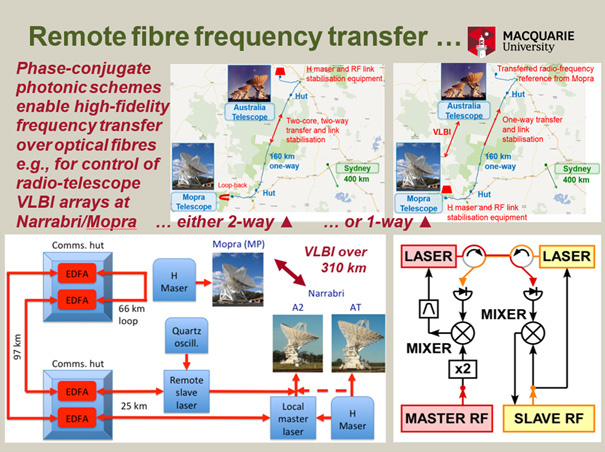 to One technique, illustrated below, comprises a phase-conjugate photonic scheme for high-fidelity RF-over-fibre frequency transfer that has promising applications as a cost-effective way to control VLBI (very large baseline interferometry) arrays of radio-telescopes. Our most significant results (not yet published) were obtained over a two-way distance of ~310 km at the CSIRO’s ATNF (Australia Telescope National Facility) spanning the Narrabri and Mopra areas of northern NSW. They indicate that it may be possible to operate VLBI arrays with fewer expensive hydrogen-maser frequency references.